Sally Jo was born in Port Angeles, WA to “Stun” and Iris Bray on June 23, 1939. At 6 years old her family moved to Bellingham, where later she attended Bellingham High School and graduated in 1957. She went on to attend a year at WWU, having the most fun working on the yearbook staff. In July 1962, sally was introduced to Ron at Battersby Field during a baseball game. By September they were engages and married late November. The following November Sherryl was born followed by Steve in 1966 and Theresa in 1967. When the kids became old enough to be at home alone, Sally returned to work. She worked for public utility for 25 years, ruling the office and keeping her co-workers in check. Sally was an amazing wife, mom and grandma who adored her family and her family adored her right back! 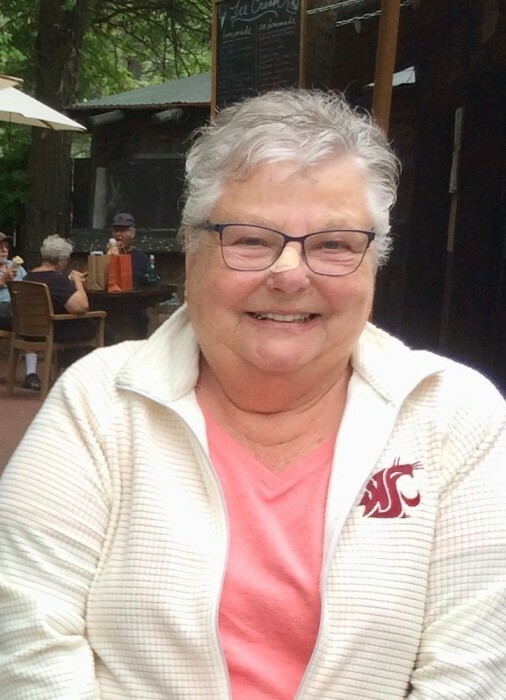 She enjoyed camping (in the RV), reading, knitting and going to Pullman for WSU football games. She loved sitting with her friends who made the many steps to their seats worth the climb. Week days Sally could be found shopping with her daughter and granddaughters, attending bible studies or running off to a luncheon. Sally loved the beach, enjoying summer vacations to the Oregon coast with her family. Sally is survived by husband, Ron and 3 children, Sherryl, Steve and Theresa and 9 grandchildren; Devyn (Lawrence), April, Anna, Corey, Emilee, Maddison, Chris (Allysha), Kaylee (Korrey), Chelsea and 2 great grandchildren. A celebration of her life will be held Monday, April 15, 2019, 2:00 PM at Northlake Community Church, 1471 McLeod Road, Bellingham, WA.